Designs by Lisa Somerville: Black Rose Artichokes and some Birthday Blog Candy! Black Rose Artichokes and some Birthday Blog Candy! Black Rose Artichokes...I bet you're wondering what that's all about huh? 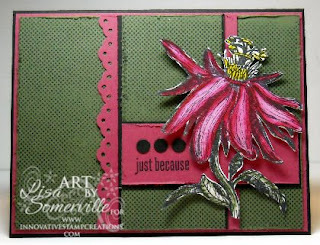 It's this weeks Color Challenge 209 on SCS, and it's perfect for the new Passion Flower set from Innovative Stamp Creations. Passion Flower is not being released until March 13, but you have a chance to win it from me as MY Birthday gift to you! I used the Marker Watercoloring Technique to color the flower, then cut it out and popped it up on dimensionals on my base card. I used Little Specks as my background stamp. To enter to win my Birthday Blog Candy, just leave a comment on this post by 11PM CST on Sunday, March 15th and you'll be entered into a random drawing to receive the Passion Flower Plate shown here. I'll have the random number generator pick my winner! Because Blogger does not store email addresses, be sure to check back on Monday, March 16th to see if you've won! One comment per person - thanks! i would love to enter to win this Beauty! Happy Birthday Lisa--March is a great month for bdays--I just had mine last week. Lovely card and that is a great sheet of rubber. Thanks for giving to us to celebrate your special day! Happy Birthday Lissa, wishing you much happiness as you are an inspiration to me. Your cards are beautiful. Yes, I would love to win this set, please enter me. I follow your blog and love your creations! Happy Birthday to you and thanks for giving someone out here this beautiful stamp sheet as a gift. I appreciate the chance. HAPPY BIRTHDAY,GF!!!! 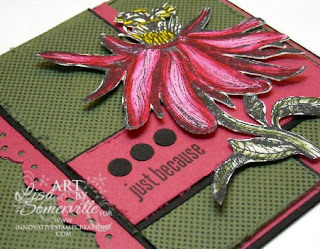 Love your card--you're right colors are perfect for that stamp. Happy birthday to you, Lisa! You did a wonderful job with this gorgeous flower! Your card is gorgeous Lisa! Can't believe you cut that entire flower out! Happy, happy birthday Lisa! Hope your special day is filled with love! Happy Birthday, Lisa! Very generous of you to celebrate with all of us in this way. Love the card... such an unusual flower! 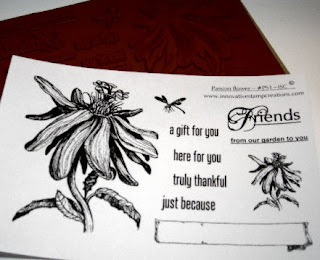 I adore flower stamps, and this one is super!! Thank you for all the inspiration - love your cards!! Happy Birthday to you, Happy birthday to you (can you hear me singing?) Happy Birthday and many more. Your card is beautiful. Thanks for the opportunity to win a beautiful sheet of flowers. Happy Birthday Lisa! We should be giving you gifts for all of your daily inspiration! Happy Birthday, Lisa!! What a beautiful card, as are all of your creations! I'd love to have the lovely stamp set. Happy Birthday Lisa -- this is a great card and I would love to enter for a chance at this stamp image. The passion flower is beautiful!! happy birthday wishes! your work is wonderful! hope you have a great day! Wow, what a neat set! Would love to win it Lisa, thanks for the chance! Well Happy Birthday Lisa, may this year be filled with lots of love and joy. Beautiful stamp set - looks like Betsy has done it again! Happy Birthday! That's a beautiful card!! Happy Birthday Lisa(oops belated - I just looked at my clock)! And most of thanks for giving us the gifts. First your inspiration and expertise and now some really fun candy. I know I've won before but a girl can hope for a repeat right? I really enjoy your cards and techniques. They inspire me! Happy Birthday, and thank you so much for this chance to win this beautiful set. Happy Birthday! What a lovely stamp! Happy Birthday!! Your card is beautiful! Thanks for sharing your talent with us and the chance to win blog candy! Happy Birthday! All the greatest birthdays are in March - mine is the 28th! What a great card and I love that flower. Thanks for the chance to win! Hi Lisa! It's always good to check your blog even if I see your creations on TJ! Greag blog candy...and whose birthday? Yours? Best Wishes for a Happy, Happy Birthday! I love your card and thanks for sharing! Very nice stamps and you have made wonderful card. Happy Birthday Lisa. I check into your blog every now and then and when I saw this, I just knew it had to be ISC. It has Betsy written all over it. Wish I had time to stamp something now and then. I'll enter my name, but it will be a while before I would get to use it. Happy Birthday to YOU! Hope your family treats you with so many goodies. WoW this is some celebration candy. Your card is just beautiful and love how you did the flower. You are so creative and super inspiring. Thanks so much for a chance. that plate is gorgeous....and so is your card. Love the color combo and the layout! Hey Lisa! Happy Bday!!! I followed the link from Betsy's email and love your gorgeous sample!!! This is fabulous! Happy Birthday Lisa - beautiful card and some more great stamp sets from ISC. Would absolutely love to win this set. Happy Birthday. Hope you have a great day! That card is gorgeous, love the colors and the stamp. Happy Birthday Lisa!! Hope you had a wonderful day!! Great card as always!! Happy Happy birthday. I love your blog and I just signed up to Follow and to receive your newsletter. I love the stamp set up for candy and I appreciate the chance to win it. Thanks for all you do! Happy Birthday to an inspiring card maker! Your cards are beautiful. Thanks for the chance to win a great set! Happy Birthday, Lisa! You are such an inspiration to me. Hope you are enjoying your day!